Zafu. A high, round cushion filled with kapok, typically used in zazen Zen meditation. Juni-chan. 'Chan' is a diminutive, endearing suffix, often used for young children. 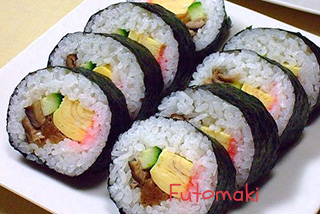 Futomaki. A hearty sliced sushi roll, typically filled with rice (white) and bits of cucumber (green), omelette (yellow), kanpyo (marinated gound; brown) and shrimp flakes (pink); rolled in nori-seaweed (black). When sliced, all the colors should meet and please the eye. Kawai-i, desne? She’s cute, isn’t she? Mochi. Sweetened rice cake for festive occasions. Special gooey rice is cooked, then pounded to a sticky paste, and pieces are squeezed off and eaten. A family might pound the mochi all together, with father pounding, grandmother reaching in between each stroke to turn the mass over, and other family members looking on in gleeful anticipation. Obon. 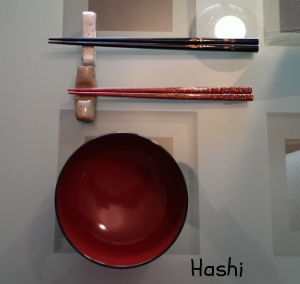 A three-day, Japanese, Buddhist festival to honor the dead. In Japanese-American communities, it was a chance for young girls to wear traditional costumes and head decorations and to show the graceful Obon dances they had learned. 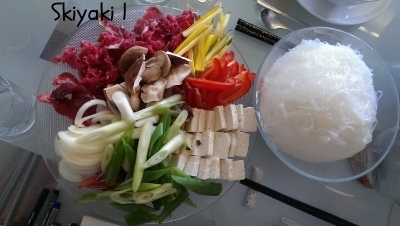 Skiyaki (sukiyaki). Traditional Japanese hot pot stew based on thinly sliced beef simmered in a broth made of tuna fish fond (dashi) or beef broth, shoyu, sake (rice wine), and sugar. Traditional ingredients dipped into the broth and cooked are: thread noodles, bamboo shoots, scallions, mushrooms, tofu, greens of some type. Bites of the cooked skiyaki may be dipped into raw egg before eating. Futon. Traditional Japanese bedding consisting of padded mattresses and quilts that are folded and stored away during the day.